Earlier this week we closed voting on four major categories in the Nintendo Life community Game of the Year awards. Thousands of you took part in the polls and via email submissions, but there is one prize left - that of overall Game of the Year. As promised, then, we've taken the top five from each of the four categories - Switch retail, Switch eShop, 3DS retail and 3DS eShop - and combined them in this final poll of 20 games. You can only choose one, however - yep, it's a tough decision. The top three will be named along with all of the other winners during the Holidays, so here's your chance to choose your favourite game (on Nintendo hardware, at least!) of 2017. The voting closes at 9am Pacific / noon Eastern / 5pm UK / 6pm UK on 24th December. Hit up the poll below and debate the vote in the comments! Voting has now closed - thanks for taking part! Easy one for me - BotW! Voted LOZ. I haven't had a chance to play XC2 otherwise I might have voted for it. I'm still playing XCX. I love the artwork a lot more than the new one. Super Mario Odyssey for me, sorry BotW, I love you but Odyssey is SO good! Zelda Breath of The Wild will be a contender for one of the best games of all time, not just this year. Super Mario Odyssey got my vote. I expect Zelda to win but Odyssey is my personal favourite game of all time. I felt a joy playing Odyssey that no other game has given me. Breath of the Wild. Even in a year stuffed with great games, it still stood out from the competition. Unpopular opinion but I think giving Mario Odyssey the same score as BOTW is an insult to BOTW. Odyssey is maybe a 7 or 8 in my opinion. Would've really loved to vote for Splatoon as I think it's phenomenal and deserves proper appreciation. @Noonch SMO is incredibly fun, but yeah, it's not on the same level as BotW for me. I mean, I guess Zelda. When I was done with Zelda, I gave it an 8.5. I’m only saying Zelda because it’s a solid game, but the unanimous 10’s it got, left me scratching my head. I should say Splatoon 2 because it got way more play time outta me than Zelda did, but it’s single player game left a lot to be desired. With a confused heart... Zelda. Shadows of Valentia. After Fates this is the game that reminded me why I have loved Fire Emblem so much. I voted Zelda. It's going to be either Zelda or Mario, no doubt. I would say XC2, but it feels like it lacks the polish of the other two. Voted for odyssey. Odyssey just BARLEY was better in my opinion. XC2. BotW really missed the mark when it came to actual world building, character depth, and proper exposition/lore. Say what you will about the timeline, you can't deny that the devs and their focus on continuity after OoT didn't help enrich WW and TP. In fact, it's that continuity and beginning of actual continuity, lore, exposition, and proper world building that began to make Zelda feel truly like an ongoing legend, rather than the same rehashed story with a spin. XC2 makes a world WORTH exploring, by giving mundane NPCs a shot at handing out narratively rich sidequests. The main quest itself brings up questions, and then gives you proper exposition about this nrw world you're introduced to. BotW's greatest narrative "sin" is that it makes you asks questions about Calamity Ganon's origins, why the Shiekah were so advanced and how they got that way, who the hero and princess from the past were and what they were like, and it even ends on a cliffhanger. It's REALLY hard to debate between BotW and Odyssey.......and I'm sure XC2 is up there but given Monolith's typical quirks, it doubtfully can compare to the other two, but I haven't looked into it yet, so I can't say either way. I gave the nod to BotW since it was so long in the waiting game and really delivered despite the hype. Odyssey had a shorter hype cycle to live up to in comparison, so BotW really came through against all odds. Breath of the Wild definitely deserves it, it was the game everyone was heavily anticipated and it delivers on all expectations. Hm... Zelda, Zelda, or Zelda? I think I'll vote for Zelda. Xenoblade 2. But, I have yet to play Zelda. Mario for me, zelda, with the frame rate issues it has it doesnt deserve to be number 1 this year, top 3 yeah. How Mario + Rabbids Kingdom Battle didn't make Top 5 Switch retail games is staggering. I'm voting for it here in any case, lol! As much as I'd like to put Xenoblade 2, Breath of the Wild is the correct answer here. Breath of the Wild without a doubt. Odyssey and XC2 are extremely strong contenders, but BotW was a special experience. "You can only choose one, however - yep, it's a tough decision." BOTW for me and closely followed by Xenoblade Chronicles 2. Mario is definitely in my top 5 but not sure where. Think Disgaea 5 would be 3rd. 260+ hours so far in Splatoon. I’m ready to hear about what’s coming in 2018. Bring on the Nintendo Direct! @NEStalgia For a game about adventure, proper world building is necessary. Like, I'd be all for a reboot that builds its own canon in order to make a consistent backstory. I'd even be okay if they went with the Final Fantasy approach. The problem is, BotW, if viewed as a reboot or standalone game, doesn't set out to do what it should exposition-wise. Even in the NES era, you were given a decent amount of exposition in the manuals, and during that time you could legitimately make a game and sell it without a backstory. BotW excels at gameplay, but gameplay isn't the only reason I like Zelda. If they can't create a new and exciting world that tells you about its past, then I'd honestly prefer that they fall back on the timeline to cover up that narrative gap. BotW is to Zelda, what Fallout 4 was to Fallout New Vegas. Great gameplay improvements that dwarf the latter titles, but the lack of an actual focus on continuity (or spending the time to focus on making a separate continuity) and telling a gripping story like past entries hurts it in the end. Here's to hoping that they make a game set 10,000 years before BotW, that answers all of our questions and actually starts to build lore and proper exposition. Breath of the Wild for me. The game is just something special, and might end up being not only my favorite Zelda, but my favorite GAME of all time, period. Shout out to Stardew Vallew and Mario Odyssey, which are both 10/10s as far as I'm concerned. Odyssey is great but it is not the best Mario episode ever and I have too much fun with Mario Kart 8, so my vote is for Mario Kart. ZBOTW hands down. Zelda and Xenoblade 2 basically only 2 Switch games that held my attention at home and on the go. Well worth the price. I love Metroid, Zelda, and Splatoon, but I’m going with Oddysey! A little unfair. Zelda has been out for months, played and finished and then replayed with the DLC. While most of the Mario Odyssey games are hidden in wrapping paper under Christmas Trees. At least extend the closing date until the end of the year. We all know its between Mario and Zelda and Zelda has an unfair advantage. Otherwise the winner is Zelda and Mario second, the rest, anyone's guess. Easily Mario or Zelda, but a hard choice for me between the two. I think those two games deserve the love they get. Both are awesome. Another no-brainer competition. 2017 has been a great year for games, not just on Nintendo platforms, but everyone knows which one will win. Hint: it rhymes with meth of the mild. @Tarvaax BotW has incredible world-building, though. It just doesn't hit you over the head with text boxes and history books, instead choosing to embed its story-telling in the design of the game itself, from the weathered ruins and geological marvels dotting Hyrule to the sound design (recall how the music evolves as you build up Tarrey Town, for example). If it were any other year, I'd give it to many other choices, but this year, Zelda gave me an unbelievable, unexpected, incredible, challenging, and enormous adventure that is unlike anything I've experienced before. I walked away from it weathered like I literally went on the quest of a lifetime, but accomplished that I made it to the end. Best gaming experience I've had in years. The vote for worst game of the year hasn't opened yet. 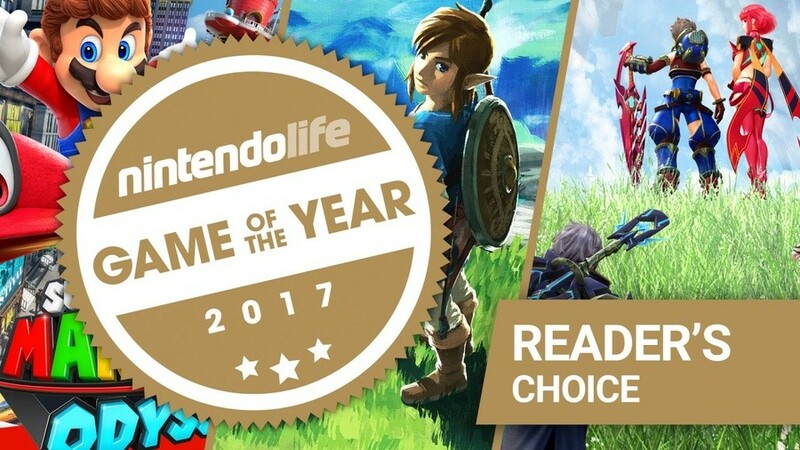 And you know what, the title of the story leaves itself open to interpretation, "Vote For Your 2017 Nintendo Life (insert adjective here) Game of the Year". It doesn't define the choice clearly enough. Had to be Breath of the Wild for me. Ever since I played it at a preview event, I was mesmerized by the sheer vastness of the world, the colors, the music, the physics, just everything felt like it belonged in that game. ARMS is my game of the year. Why is it missing from this list? Where is Mario + Rabbids? Out of some truly spectacular titles Nintendo has hit HOME RUN after HOME RUN this year , what a year to be a Nintendo fan from the list above I chose Super Mario Oddessy which I think is sheer brilliance but I can say it was not an easy choice there are atleast 5 other titles on that list that easily deserve to be called game of the year. Hard for me to vote for anything other than the Last official Nintendo Wii U released game, Zelda: Breath of the Wild. I might be playing that for a while. I did like Blaster Master Zero, but after I started BotW. Almost ever other game was a distant 2nd. Splatoon is always fun. Also, next on the backlog for me will be XCX. @Tarvaax I don't think I've ever seen someone complain about absolutely nothing for as long as you. Truly amazing, you have my thanks. Cor... Tough choice. Splatoon 2 is my most played game (320+ hours), and Stardew Valley has allowed me to have some great conversations with my non-nintendo appreciating friends, who I never really had anything in common with before. In the end, however, I went for Zelda, as it delivered a sensational gameplay experience, which absolutely blew me away, even with my tremendous expectations for it. And I haven't even bought the Zelda DLC yet. @Ralizah It has you ask questions, yes, but it doesn't answer them. That's not a good thing to do for a standalone entry. Now, if you were to tell me that was on purpose, that BotW was just setting up for a grander story, then I'd say that's plausible and agree. That said, BotW itself doesn't attempt to answer any questions it has you asked, which is horrible world building. I look forward to a game set 10,000 years ago, back when Hyrule wasn't ignorant of its own past. THEN we can actually get some questions answered and REAL world building that isn't just headcanon and fanfiction. @Switch_will_fail I fail to see how I'm complaining about nothing. Maybe you don't care about narrative and world building in your Zelda games, that doesn't mean you should turn a blind eye to the fact that past Zelda games did it properly, and you shouldn't put others down for enjoying that aspect of the series. Manners and empathy. @NEStalgia I think many of the people who grew up playing the original Zelda really appreciate BotW. The essence of Zelda, which you how I feel about it, is exploration and discovery. Everything else is secondary. In my opinion, as Breath of the Wild proves, even labyrinths are one possible aspect of what makes this game series great. I am glad this game and the original is not just another "dungeon crawler" . Mario + Rabbids would be my pick but since it wasn’t there I went for Steamworld Dig 2 instead. @Tarvaax And you shouldn't be knocking a game for not being like past games in the series. When that said game is specifically trying to break past conventions of a series that have long been stale. Yet here we are. @Tarvaax But the game and an adventure doesn't need backstory and exposition and certainly doesn't need characters. Those were developments Aounuma added after Miyamoto stepped aside form the series. BotW marked Miyamoto taking a more active role again, and thus the game is more an echo of his early visions for the series. An adventure with you exploring, and Link is a literal Link between you and the world. @Tarvaax I disagree. The game has excellent world-building. What it doesn't do is lay out an explicit history, because this game is less interested in developing a narrative than it is in providing an exploratory adventure within a world. I also think that a lot of the "lore" that Zelda fans are so hung up is often unimportant, as evidenced by the mental hoops you have to jump through to try and justify the layout of the so-called Zelda timeline. This makes sense considering Nintendo always conceives of the gameplay and then fashions the style, story, aesthetic, etc. to line up with it. There are clearly some connections between some games, but the whole thing falls apart when you try to frame the entire story as this grand epic that evolves over the course of the entire series. They just went the extra step with Breath of the Wild and de-emphasized the importance of didactic elements within the game itself, instead choosing to convey a sense of history through your exploration of Hyrule. Zelda is my favourite game series but Odyssey just edges out BotW due to the pure joy it brings. It gave me the same feeling I had playing Super Mario World all those years ago. Felt like I was a teenager again playing it and for that it deserves the win in my book. Kind of boring that LOZ: BOTW is going to win. I voted for Sonic Mania because it’s a classic Sonic game after decades a waiting. @Ralizah Haven't they even written off the differences as "well, it's a legend and stories told like that tend to change as people tell them" roughly meaning "half of it is bull, but there's an in story reason for why it's all random bull." It's the Legend of Zelda and you KNOW IT! Wii U version is astounding. We'll be all aboard the Switch Train from Christmas morning but I have absolutely loved my Wii U, since the day Super Mario 3D World released. I will have it around for a long time yet, Switch or no Switch Santa Claus! @PAppleyard Sonic Mania is a classic Mario game...?! Breath of the wild is my favorite video game of all time. Im a gamer since 1997. I know what's a wonder is when I find it. @NEStalgia Probably. It amazes me that people still play Nintendo games and expect decent narratives, or try and find these hidden patterns throughout their games. As if Nintendo wasn't clearly just making up stuff as they went along. They care about gameplay first and foremost, and stories, characters, etc. exist only to supplement the gameplay. It's why I love them! In an industry now overrun with amateur screenwriters, Nintendo hasn't forgotten that the strength of video games comes from how we interact with them. Mario and Zelda tied perfectly in my opinion. But forced to choose, I went with Zelda. @MartyFlanMJFan Gah, stupid mistake. Corrected now. @Switch_will_fail Just because some of you can't handle criticism, doesn't mean that it's wrong of me to do so. @NEStalgia I've already said that I loved the NES callbacks to focusing on adventure and exploration in past topics where I've defendes that direction for the series. I love a lot of the changes, one of them being less emphasis on dungeons. That doesn't mean that I don't have criticisms, and that doesn't mean those criticisms invalidate the good things about the game. I only ask that you empathize with my plight, instead of looking at my particular criticisms and rushing in either to blindly defend the game in its entirety, or to de-legitimize an aspect I like about the series just because you yourself can enjoy them without it. Metroid. No doubt about it. I’ve been working on my lists and look forward to being judged for having opinions when I share them soon. Can't see any other winner than the obvious but it'll be interesting to see how many votes have gone to the others. A surprisingly easy answer, given how many excellent games got published this year. Still, Breath of the Wild is an utter game-changer for me, and for my money the best game made since Super Mario World. @Switch_will_fail I don't just go and play the "classics" because BotW does everything better than past entries besides story (ALttP, WW, TP, SS) and sidequests (MM). I'm waiting for a Zelda game like BotW, but with a great story and characters all around like past games. The complete package. Let's also not forget that the advertisements also sold both the game and Champions Ballad as story heavy. Super Mario Odyssey is just an amazing game. It takes everything a 3D Mario does well and perfects it. But when I think of a GOTY, it has to be truly exceptional and blow you away unlike anything else. BotW did that. I did and didn't have expectations. And it completely shattered any I had and fulfilled any I didn't realize I had. Debated between BotW and XC2... but BotW is so much more polished that it kind of wins by default. I did not appreciate Odyysey. @SLIGEACH_EIRE And that’s coming from someone who played the inferior Wii U version! I also voted BotW. SMO was also awesome but more evolution than revolution. I’m not feeling it with XC2. It’s good but feels like a rushed sequel. @Noonch They both deserve 10's because they both achieved what they set out to do perfectly. If Odyssey deserves a 7 or 8 just solely because your basing it's score on another games score, then almost every other game on the Switch would be deserving of a 4 or a 5 based on the comparison to other AAA games. That would be unfair and that's not how review scores are determined at all. That said, I also voted for Breath of the Wild as GotY. Why did a remake (graphical), make this list? How did Mario & Luigi Superstar Saga + Bowser's Minions beat out Mario + Rabbids? Also, Stardew Valley was released over a year ago on other systems...with that line of reasoning why isn't DOOM on here? Take out Mario & Luigi and Stardew and replace with Battle Chef Brigade & Golf Story. Thumbnail is pretty bang-on for which games are gonna get the most votes. My top 3 would have to be: Xenoblade 2 #1, Zelda BotW #2 and Splatoon 2 #3, with Mario Odyssey not far behind. Whatever the GOTY turns out to be, can't deny this year has been awesome for gaming! @Tarvaax That is true, I'll give you that. BotW story takes a backseat intentionally so that the open world and the gameplay can shine more brilliantly. But that doesn't at all excuse Nintendo's poor choices in marketing the game. They could have focused more on the world and gameplay aspects, and less so on the story in the trailers. I'm sure less people would have felt mislead. Odyssey is an amazing experience....until it ends and you get all moons. Whereas BotW is still amazing even when you've done everything. Mario Odyssey for me, one of the greatest Mario games I've played and is up there with the likes of 64 it's just a shame we didn't have more difficult levels such as darker side of the moon. BOTW had some great elements and how you interacted with the world is better then any open world game I've ever played but the lack of story and dungeons spoiled it for me and it's far from the best in the series. I've seen some comparing it to the original Zelda and in some ways it goes back to its roots but that game still had 9 dungeons versus none in this. Xenoblade 2 could be up there but I'm only on chapter 3 and I'm having a great time so far. Other than that Sonic Mania was a fantastic return to form that is up there with the best the series had to offer on the Megadrive. Well my personal GOTY is Persona Q Shadow of the Labyrinth, I didn't bother to play it until a few months back because frankly I was burned out on Persona, but this game turned out to be better than all the other Persona games AND better than all of the Etrian Odyssey games, this was a real surprise hit for me. If we're only counting games that game this year, then I'm going with Binding of Isaac Afterbirth+ on the Switch. @avocadopear Re-read the article. If you still don’t understand, let me know and I’ll try to explain it to you. Zelda is above everything else this year. It really is an amazing game. Whatever quarrel you may have against it, is on you, not the developers. They took possibly the most beloved and iconic franchise in videogame history, flipped it on its head and came out winners. @Tarvaax I 100% agree with you. I'm surprised few people have mentioned this. Honestly I think, for me personally, that is BotW's biggest flaw. I loved how TP and WW tied to the lore by tying into Ocarina of Time and the end of that game. Honestly one of my favorite aspects of TP is how you can explain so many aspects from events that occurred in Ocarina, like who the Hero's Shade is, why Link and Ganondorf already have their Triforce pieces, etc. It teuly made the game feel like an epic, and a legend that you could imagine telling to others. OoT, MM, WW, TP, etc. Felt like epics and legends. BotW doesn't have that same sensation. It has something else the previous games didn't have - a sense of freedom, discovery, and being one with nature - but there is no reason why both cannot occur in the same game. I hope the next Zelda game really focuses on story and ties into the lore. Are you kidding? I have to choose between BotW, Odyssey, Splatoon 2, Xenoblade 2, Stardew Valley, Sonic Mania and Pokemon G/S/USUM?! My head just exploded. Not even sure how I am still typing this comment. @Julien I didn't read it so I can't re-read it. Can you explain it to me? I love Breath of the Wild, but darn it I had to vote for Samus Returns. Surprised that Arms didn’t make the list. I feel like it’s so underrated. All three are fantastic games, but there's a very clear order in my mind for how I'd place them. Xenoblade and X are tied for the spot of my favorite game, and while I haven't finished 2 yet, I'm ~45 hours in and it's absolutely what I'd expect from the series. Breath of the Wild has come in right after the Xenoblade trilogy in terms of my favorite games of all time though, it's such a massive and incredible game. Splatoon 2's also in my top 10, and it's probably the most fun online game I've ever played. It's not every year that I discover three new games that get into my top 10 of all time, but this was one of those years! @Ralizah @NEStalgia you're right about the legends part. The opening to Skyward Sword tried to make that clear. Super Mario Odyssey for sure. As much as I love Mario and consider myself a much bigger Mario fan than a Zelda fan, for me the choice so obviously has to be Zelda. Odyssey is wonderful and I love it, but Breath of the Wild is transcendent and I think it will leave a much bigger impact on gaming than Odyssey will. That said, I won't be upset if Mario wins this vote. Xenoblade Chronicles 2, an easy vote. It leads me to sink my teeth deeper and deeper into the story, while every step of the way I end up exploring, and having fun in the world! Like, even though I want to go forward in the story? I find doing the side quest itself is already fun. I love to take care of side quest first, main story second. Do more exploration, everything! I voted Xenoblade 2 purely because it will be forgotten under BOTW. Persona 5 is my true goty though. On this list, I picked Stardew Valley. I had a passing interest on PC but the Switch form factor really cements it as a classic. Mario and Zelda were both great but both had IMO some big problems to stop them being my GOTY. My actual GOTY was Horizon: Zero Dawn. Defo not botw! After initially loving everything about this game and smashing the life out of it, on closer inspection you start to see major cracks! 1, Game is a foundation to new story arc only hence lack of lore. 2 Blood Moon serves only to reset the map for memory purposes and is actually really annoying. 6. Area boundaries between hot and cold places nonsense. One can move up one step and shiver yet climb down a step and regain warmth. Yes I enjoyed most of the game but these negs prevent botw being game of the year! @Tarvaax i fear that my commenting lead others to take more note of the content is your post and disagree as well. That said i have my own criticisms if the game, particularly the shrines. So it's not a blind defense of the game. But you're not the only one that discusses the narrative aspect... Where i disagree with that is the implication that story telling is a significant component of the Zelda series when it really isn't. 4 games in the series went that route, oot, ww, tp (which was really a reboot of oot with gameplay smoother for modern hardware), and ss. The nes,snes,ds, and 3ds entries were more traditional. Majora... i won't include in either list because it was just plain experimental with a gameplay and environment very different from any other and was almost an rpg with it's questing. But any time i hear about lore and such in Zelda u scratch my head. It never had lore beyond Gannon and the triforce. The rest was always in game lore made for that title only. In the forward to the encyclopedia aonuma even said Miyamoto never really cared much about continuity and aonuma tried to shoehorn or together into a story. Not an easy choice... I went with Zelda but I was really tempted to go for Metroid or Valentia. I'm glad it was a tough call. That means there were lots of good games this year. I guess Super Mario Odyssey for me...at least on the Switch's side. 3DS would probably be Mario & Luigi: Superstar Saga + Bowser's Minions, with Brave Dungeon and Miitopia as runner ups. Odyssey was great, but it's not even in the same league as BotW. BotW easy. I haven’t been so engrossed in a game in a long, long time. Simply could not put it down. However, there were so many great games this year, so the real winners are the gamers. Well, Splatoon for me - I've never been so invested and engrossed in a game - nor has a game bought me such social momentum as travelling to meet up with squadmates and having loads of fun in Ranked, league and Splatfests! I know what I should’ve chosen considering quality and bang for buck, but I chose Sonic Mania. That game and the Sonic Statue in my room bring me so much joy. It’s what I always wanted. I love most of the games on this list though. Cheers. Tough to pick, but Mario Odyssey just did everything I wanted in a Mario game. Zelda was good, but I feel like I'd rather had a more of a classic Zelda adventure with large dungeons and such. I voted for Super Mario Odyssey just because it's the type of game I like a lot and especially after playing Super Mario Odyssey, it was hard to go back to Zelda and made it stand out how much more I probably enjoyed Mario. BotW is an amazing game and I put over 200 hours into it. But afterwards I still have a Zelda itch. I appreciate the new direction but too much was missing for me, items and dungeons and most of all unique bosses. So even though it doesn't have as high of a play time, for me it's Odyssey. It is everything a Mario game needs to be and more. They experimented, innovated, and more and stayed true to the Mario experience. I was tempted to vote for Stardew Valley or Splatoon 2 out of sheer perversity. They are both games that have captivated me for dozens of hours, and will probably stick in the top tiers forever in my mind. But the game that I've played more than both of them put together, is also the game I bought the Switch for, the one I've been waiting for years to play, and the game that brought Nintendo back to the top of the heap for millions of people around the world. It's the obvious winner, and this poll might as well have only had one choice. It's SMO, of course. ... nah, come on. Odyssey is a brilliant game... that I've played 15 hours of and felt like that was enough. BOTW could have just been named LOZ:GOAT, because that's what it is. Simply a classic, the obvious and well justified winner here. Decades from now, when the video game elders gather in dodgy Psi-Web chatrooms to talk about the defining moments of the Switch Era, 90% of the talk will be about Breath of the Wild, and those who didn't play BOTW will be deemed to have completely missed what the Switch was all about. Not gonna lie though, in any other year SMO would have been a contender, as would several other games here and a few that didn't even make the list. I can't even remember another year that Nintendo had so many ridiculously awesome games. For me it was Zelda and Xenoblade. I'd put ARMS at third place. That game really surprised me. Better then Splatoon I reckon. No game comes close to BotW. Not even Mario Odyssey and that game is FUN! I took 250 glorious hours to finish BotW. No game this year has brought me that much joy, surprise, awe and "oh crap!" moments as BotW. Big thanks to Nintendo for this masterpiece of a game! BotW. It's so good, I'd buy it twice. Breath of the Wild is an easy pick for me. It's the best game I've played in years actually. I absolutely love Mario Odyssey but still feels BOTW is in a different league. It shows how a great year for gaming 2017 was. Mario Odyssey for me. I still prefer Sunshine, but it was a fantastic game. The moon system was pretty darn disappointing for me, though. I wish it could be like how it was in Sunshine where you had actual quests to go on, not just randomly stumbling upon the collectables. There wasn't a lot of super memorable music, either. I expected more in that area. Everything else was top notch, though. Really enjoyed it. I have a feeling something like Horizon would have been my GOTY if I had played it, though, or maybe some other game. I don't think I'll ever understand why people like BotW so much. I know it's totally subjective, but I lost a lot of interest once I realized that there was little to do in the world except kill stuff and look for shrines and Korok seeds. It's just such a shallow game for how popular it is IMO, and completely and utterly disappointing after I had such high expectations. I really only kept playing because the shrines were kind of fun and I wanted to see what the different settlements looked like and if there were any really memorable locations, and while there was some of that, there wasn't nearly enough. The dungeons in BotW are a mere shadow of the traditional dungeons, and overall I just kind of didn't find the game that fun when I wasn't in a dungeon or doing part of the story (which was pretty weak, even for a Nintendo game, let's be honest). Almost everything else was just filler and not really substantial for the most part. Honestly, it was barely a Zelda game, and it lost like 60% of the magic of the old games for me. I still liked it, but it just doesn't go beyond "like" for me. It's fine. It's enjoyable. But I'm not gonna have much nostalgia for it at all. It's just an okay open world game that I had a good time with, and probably will never touch again. I kinda regret buying the DLC for it, too. It's basically just a chore to get through the Champion's Ballad. I've still only played like 10 or 15 minutes of it. I am also extremely disappointed by the lack of Golf Story. Give some attention to games that are actually new, instead of rehashes like Stardew Valley, Rocket League, or Gold/Silver. Ugh. Monter Hunter Stories, but since it isn't on the list I'll go with Metroid: Samus Returns. I've played BoTW for over 315 hours. I've loved every second of it. BoTW is one of the best games ever made. Not really that difficult choice for me. I love Xenoblade Chronicles 2, Mario Kart 8 Deluxe (after 20 years Diddy Kong Racing has been dethroned as my favorite kart racer ever), The Legend of Zelda: Breath of the Wild, Sonic Mania and Splatoon 2 but Super Mario Odyssey is simply a masterpiece, damn near perfect platformer, imo. Even after 3 decades of playing Mario games, Odyssey still managed to surprise me and some of the call backs to games of my childhood were awesome. The capture mechanic worked brilliantly and Mario himself controls better than ever. Creative worlds with tons of content, and, as usual, a great soundtrack. Super Mario Odyssey shot not just to the top of my list for 2017 but the top of my list for the current gen of consoles. My choice is Xenoblade Chronicles 2, despite of some presentation hiccups this is the awesome jRPG in which spent more time than in any other Switch title. The next one is Breath of the Wild & the third is Splatoon 2 in my personal top 3 list. Odyssey. I really liked BOTW too but it gets all the love. @KirbyTheVampire Wow, I agree with absolutely everything you said about BotW and your two main criticisms about Odyssey. I seriously can't decide between Odyssey and Breath of the Wild due to each brining out different feelings and emotions. SMO had smiles, laughs and joy; BotW had wonder, excitement and awe. Dang it Nintendo! You've spoilt us rotten this year! Even though Odyssey was one of the best games I've ever played, any other year it would have likely been a shoe-in, I couldn't in all good conscience vote for anything other than A Breath of the Wild. A masterpiece for the ages. Zelda, of course! Mario Odyssey comes a close second. Got to be Sonic Mania. A Sonic game that plays like the Mega Drive counter-parts! Zelda, by a country mile. Mario close behind. Those are my three choices. A shame that NintendoLife does not understand how good Yooka-Laylee is. NL says Y-L is good. But NL refuse to admit it's game of the year quality, which it is objectively. It's equally as good as Mario Odyssey. This forces me to abstain and not vote. What's the point in voting when all the best Nintendo games of the year are not nominated on the list. Yooka-Laylee should be taking 3rd place Or 2nd place as it's equally as good as Mario Odyssey. However NL fail to understand this and we can't vote for Yooka-Laylee. @the8thark I find it very hard to believe Yooka-Laylee is as good as Odyssey, but seeing as I've only played Mario I shall reserve judgement until I can pick Yooka up! FE Warriors didn't make the list so I voted for Splatoon 2 (my 2nd place game). @Noonch I couldn't agree more! Odyssey is a 7.5 for me, meanwhile there's nothing to discuss regarding BotW. It's the official Game of the Year (of all platforms, not just Nintendo) for a reason and probably the best game of all time. Although it's really hard for me note to vote for Splatoon2... but BotW just had a bigger impact. @the8thark Lol, seriously? I mean, Odyssey wasn't that great to begin with, but Yooka-Layle is really garbage. But well, I guess that's how it should be. Even bad games have people who love them and that's okay I guess. I haven't played XC2, but from my experience, Super Mario Odyssey is GOTY. It has such a beatiful artwork, amazing music, an extraordinary progress in the story, and it's totally different from any other Mario game I've played (almost every game since the DS). The Legend of Zelda has been a blast, having over 125 hours of fun playing this. It's a totally new experience for new players and already existing Zelda fans. It was very relaxing to play; everything was at your own pace, however you wanted to do it. I was just a bit disappointed on spoiler Dark Beast Ganon, since it was only a huge form that never targeted you or anything, though the story and all that happened to Zelda makes up for it. Both games are the very best I've played in a long time, and if Mario launched in 2018 it would have won GOTY. My winner is SMO. Super Mario Odyssey is the obvious choice, funny how they put the only 3 games that have a chance at winning on the bottom.